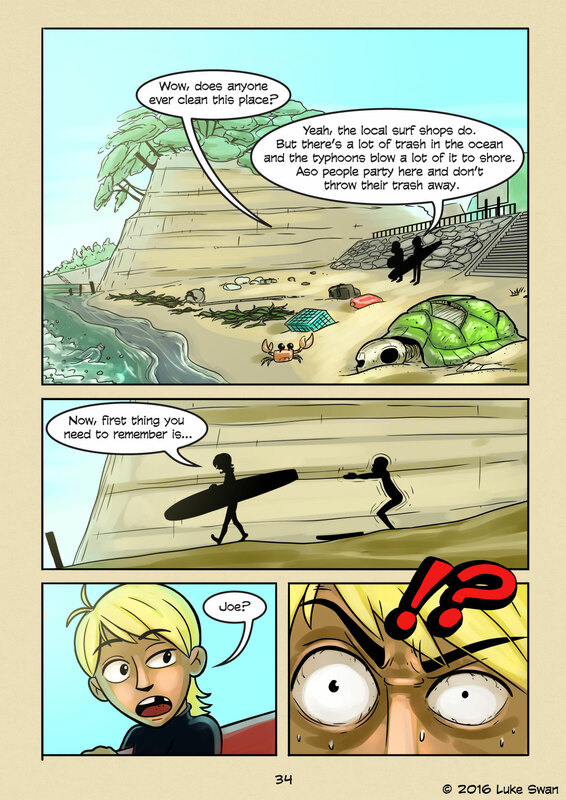 Filthy Beach (#034) | Web comic "Surfer Joe"
I’m not sure how it is in other parts of the world, maybe it’s much the same. All I know is that they’re pretty dirty here. Has been that way as long as I remember. The locals clean it regularly, it’s a service that those of us who use the beaches are always grateful for. Where does all this trash come from? I think most of it washes ashore from the ocean. Especially storm season a lot of interesting things blow on to shore. I’ve seen televisions and refrigerators, lots of plastics. And TONS of seaweed. Harvesting seaweed is a big thing in Japan, and what is cut loose is thrown into the ocean and washes ashore. Of course, as gross it is to swim in it at least it’s natural. After the tsunami of 2011 the amount of stuff the typhoon brings has been multiplied significantly. Every storm always blows in a boatload of tires, which is kind of funny. Seems like there is an endless supply. A lot more driftwood too… But the trash that the storms bring can’t really be helped, at least not locally. It comes from everywhere, ends up in the ocean and washes ashore. But then there are the casual beach goers. The ones from the city that maybe come out once or twice during the summer months to BBQ and party. It’s pretty much a guarantee that they won’t pick up their trash when they go home. I think this is the most maddening aspect for the people who get their livelihood from the ocean. How do we fix this? Is it a matter of educating people? Maybe… Educating a person will not make them care… at least not enough to take action. But even if you get everyone to clean up after themselves, it’s only a small part of a larger problem.